As PINS ended a triumphant headline gig at Esquires last week, the stage was with packed with fans dancing as they played set closer Waiting For The End. Over the course of the preceding 60 minutes, one of Manchester’s best alternative exports in recent years captivated fans with a set filled with a mix of tracks, some to make you dance all night and some with a cutting, menacing edge. Having played a BBC 6 Music live session for Lauren Laverne the day before and with a recent EP featuring Iggy Pop, there’s genuine hype around the five piece. PINS opened with Aggrophobe with bassist Anna Donigan filling in Iggy’s absent spoken-word style vocals before launching straight into EP title track Bad Thing. Fronted by singer Faith Holgate, PINS dipped into tracks from across their previous albums Girls Like Us and Wild Nights with band members switching instruments throughout the night – with the only constant being drummer Sophie Galpin. 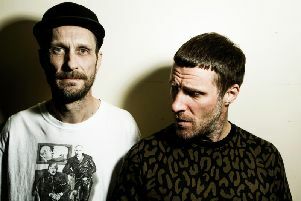 Tracks including Molly and Trouble were slow, brooding slices of indie, while the likes of Girls Like Us and Too Young To Die showed the band at their upbeat best. Other highlights of the night included PINS’ version of Joy Division’s Dead Souls, which while retaining its iconic bassline was given a fresh dynamic with female group vocals. While PINS’ roots may mainly be in late '80s alternative, two albums in, their pop hooks are deservedly winning them fans across the country. Although they’ve recently finished their headline UK tour, PINS are back on the road in May supporting Maximo Park.